The Cloud Trust Protocol (CTP) is designed to be a mechanism by which cloud service customers can ask for and receive information related to the security of the services they use in the cloud, promoting transparency and trust. 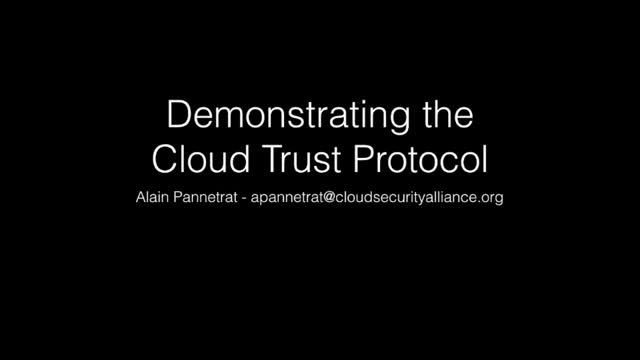 This video illustrates in concrete details how CTP can be used to monitor the security level of cloud assets. We follow Alice, a cloud customer, who provisions a set of webservices from a SaaS provider and uses the CTP API to monitor two security parameters in real time: uptime and SSL/TLS cryptographic strength. The presented demo was constructed to mimic a real cloud service using software containers and the open-source CTP prototype implementation currently developed by CSA.